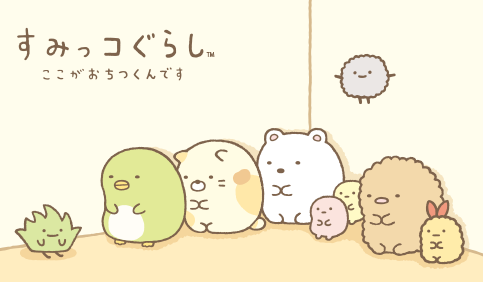 “Sumikkogurashi” are the characters living a quiet and solitary life in the corner. They might be able to settle down when they’re in the corners but they don’t like being in the center of the room. When they’re taken to the center of the room, they always rush back to the corner. Shirokuma Shirokuma is a shy bear who migrated south to avoid the cold. Shirokuma feels most calm while drinking hot tea in a corner. Penguin? Am I even a penguin? Penguin has no confidence. Tonkatsu The end of a tonkatsu. Made of 1% meat, 99% fat. Neko Shy and timid, Neko usually hides in the corner. Neko worries about its body shape. Tokage Is actually the last of the dinosaurs. It pretends to be a lizard to avoid being caught. Slowly warming up to Nisetsumuri. Used to claim corners and when Shirokuma is cold. Admires florists and dreams of being made into a bouquet one day. Ebifurai no Shippo Too hard to eat and left unfinished. Ebifurai no Shippo and Tonkatsu are friends who understand each other very well. Tapioca They are the leftovers in the cup as only milk tea was drunk up earlier. Hokori A careless bunch that often piles up near corners. Suzume Just a regular sparrow. Likes Tonkatsu very much and comes to peck at Tonkatsu. Nisetsumuri Is actually just a slug with a shell. Obake Lives in one of the attic’s corners. Stays quiet to prevent others from being scared. Yama A small mountain that looks up to Mt. Fuji. Appears at hot springs and poses as Mt. Fuji. Mogura Used to live in a corner underground. Became curious about the commotion above ground and surfaced for the first time.